The Dino-Lite Edge Polarizing Handheld Digital Microscope is a state-of-the-art CMOS (complementary metal-oxide-semiconductor) color imaging sensor that comes with full range zoom magnification. As a new generation digital sensor, this hand held microscope combines a number of important features making it the ideal tool for a range of inspection. The Dino-Lite Edge AM4515ZTL is new model/new generation device that is also an improvement on the earlier series and aimed at enhancing user experience. As a color imaging sensor, the Dino-Lite Edge AM4515ZTL serves to detect and convey information that constitutes an image. As such, it serves as an important tool for closely viewing and studying a range of samples/objects. This is made possible by a number of important features included in this hand held microscope. The Dino-Lite Edge offers 5x - 140x full range magnification (continuous zoom magnification). This is a good range of magnification that allows this handheld device to be used for observing various objects (coins, stamps, leaves, engravings etc) closely. Using the microscope, users can start from lower magnification (5x) and gradually increase magnification while viewing the object under investigation. This magnification range has also been shown to be particularly ideal for such tasks as repair, assembly or working with small fragile objects. The Dino-Lite Edge AM4515ZTL also comes with Dino-capture, which is a professional user friendly software that allows for such basic features as image viewing and capture. The software, which comes in a compact disk (CD) is fully compatible with Windows XP, Vista, 7, 8 & 10 and allows for such functions as measurement and calibration. The software, which is robust and reliable, can also be used for such functions as live and time lapse video, annotation, geotagging as well as auto and manual exposure control among a few others. It is easy to install, which means that virtually anyone can install it and start using it immediately. Because of fixed white-balance calibration that is set by the manufacturer using jeweler's color balance, color resolution produced using this system is excellent with high quality output. Apart from the software that comes with the device, users can also get the Free DinoVision Software on the internet. This version is available for download and enables for easy drag and drop of the image as well as splitting, overall and comparison. Many users will find the software useful given that it allows for a number of other functions that may be useful for given applications. In particular, the software has been shown to be very useful in Forensics while other more sophisticated users use it for manipulating images for given purposes. The automatic magnification readout displays the magnification as the user increases or reduces the magnification when viewing. Here, the automatic readouts allows for a clear view of the magnification with ease making it easier to note the level of magnification that may have been ideal for viewing a given sample. The readings are displayed on the Dino-capture software, which allows for repeated "dial in" to the desired magnification setting by simply moving the thumbwheel and monitoring the magnification level display on the software. This makes it ideal for quality inspection environments. The automatic magnification readouts (AMR) also presents a big advantage in that increased accuracy is ensured by eliminating the process of visually reading the magnification. In the process, it also allows for the possibility to be further calibrated by the existing calibration function in Dino-capture. The Dino-Lite Edge AM4515ZTL comes with a 1.3MP digital sensor with freely adjustable polarized LED light, a microtouch image capture and an improved housing with a magnification lock as well as a strong USB connection. The freely adjustable polarizer also helps reveal more detail by increasing contrast on the surface by either reducing or eliminating reflection. As a result, the user is able to get a better view of the sample, making it easier to repair, read or manipulate the said area with ease. Once the software has been installed on to a PC, the handheld microscope is very easy to use, only requiring that the user bring it closer to the object of interest and rotate the scale to either increase or reduce the magnification. The handheld microscope comes with an enhanced working distance of up to 14 inches, which allows for a wide range of samples to be observed. With increasing working distance, users can observe a greater area of the sample (with reducing magnification) and increased magnification with reducing working distance. This is an important feature of the microscope that not only allows for various samples to be observed, but also for a given sample to be viewed under varying magnifications and different working distances to get a clear view or given regions and points of interest. The microscope also comes with eight built-in LED lights, whose intensity can be easily controlled depending on the needs of the user. Apart from the lights, the Dino-Lite Edge AM4515ZTL also comes with interchangeable nozzle caps that can be interchanged when working with different working distances and operating environments. 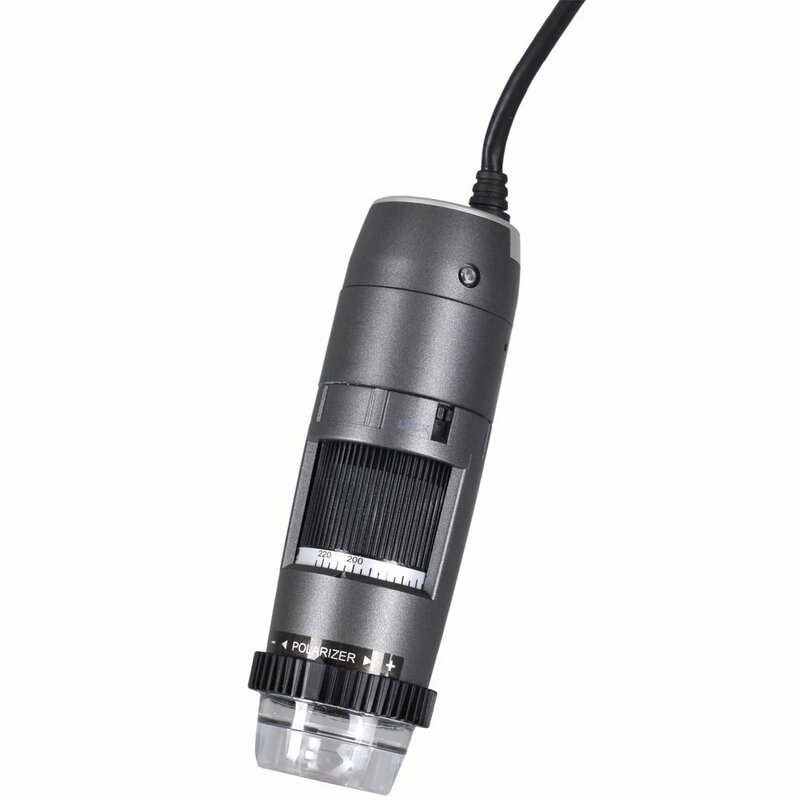 The Dino-Lite Edge AM4515ZTL is an easy to use microscope that can be used by virtually anyone. While it is used by professionals in a variety of fields including Forensics and Electronics, the Dino-Lite Edge AM4515ZTL can also be used at home by hobbyists and microscope enthusiasts as well as kids. It presents a big advantage in that it is portable and can be moved about with ease. With a magnification range of between 5x and 140x as well as enhanced 1.3 MP color sensor, users are also ensured of high quality images when viewing samples. Given that it is connected to a PC, the Dino-Lite Edge AM4515ZTL allows clear observation of images and better sharing of the viewing experience with others. The Dino-Lite Edge AM4515ZTL is a device worth checking out because it offers a number of advantages for both professionals and amateur users. It would also be an excellent tool to help kids view and learn about the fine details of a variety of objects around them including leaves, stumps, and coins to name a few. Check out more from Dino Lite here.